Why we encourage the submission of ”A-marked” films? SAGA strives for gender equality, be that behind the camera, on screen or in real life. A major aspect of gender equality is gender representations on the public eye. Films, with their unique combination of their audiovisual stimuli, emotional provoking characters, easy accesibility and extreme popularity, play an important role in projecting gender representations that can lead to the normalization of gender stereotypes. Thus, one of the ways to promote stereotype-free gender representations is by promoting gender stereotype free films. It is also crucial that the audience will become aware of the unrealistic gender representations on screen. As discussed before (see subpage ”Facts”), wo representation under- and miss-represented on screen. Though it sounds easy, most films fail to pass the Bechdel Test. Put it to the test yourself the next time you watch a movie. The Bechdel Test does not guarantee the quality of a film, nor is it completely successful in setting apart the movies with a high female representation from those with a low one (just imagine that a movie that would include solely of only one female protagonist would fail the test! ), but it’s a first and easy indication of women’s representation in a film. And though a simple rule-of-thumb, the Bechdel Test does succeed in promoting the films where women have an inherent value and existence and do not need to exist in a film to only serve the purpose of an other male character. In order to raise awareness on women’s representation in film, four Swedish cinemas (Bio Rio, Roy, Spegeln, Röda Kvarn) have initiated the ”A-mark” certification for films. 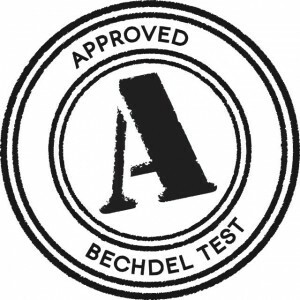 All films that pass the Bechdel Test are stamped as ”A-marked” films. This way, the audience becomes aware of the gender bias depicted in a film and, hopefully, so do the filmmakers, film festivals and, in general, the film industry. We are very happy to have Bio Rio, one of the pioneers of ”A-marked”, hosting SAGA!